A generation has been growing up with the literary Harry Potter universe unfolding before their eyes… and while that was happening, a cinematic Harry Potter universe began to unfold as well – both extremely popular and both extremely profitable. And now, as we reach the end of the Harry Potter cinematic story – as you well know the end of the literary story was reached a few years ago – the final chapter (Harry Potter and the Deathly Hallows) has been split into two full-length films. Seeing as the book is so lengthy (and the sixth movie left out so much storyline because of its brevity), this seemed like a wise move when I heard about it. And now that I’ve actually seen the movie, I have to say that it appears that it was a wise move indeed. The latest Harry Potter film is expertly paced, the most grown up of the series to date, and out paces the previous films in terms of quality on almost all fronts. One of those fronts is the composition by Oscar nominated composer Alexandre Desplat (The Curious Case of Benjamin Button, Lust, Caution). Though this is the first film in the Potter franchise that Desplat has scored (the third for director David Yates), Desplat’s score feels perfectly created for the dark wizarding world presented here. From the expositional darkness and barely suppressed excitement in the opening notes of “Obliviate” (which starts quietly 10 seconds in and builds for half a minute) Desplat establishes his musical playing field and runs with it for the rest of the soundtrack. Alternating between eerie (“Bathilda Bagshot”), dramatic (“Ron’s Speech”), and gentle (“The Deathly Hallows”), Desplat weaves all of his music through the same themes he establishes early on. The three tracks that cover Harry, Ron, and Hermione’s disguised trip into the Ministry of Magic (“Ministry of Magic”, “Detonators”, and “The Locket”) were my favorite during the film – capturing a strategic blend of urgency and danger with a bouncy undertone of humor for levity, and prove equally enjoyable here on their own. The drum solo followed by a few awkward brass beats that happens about a minute into “Detonators” is a fine example of Desplat at his finest, especially since he effortlessly transitions this surprising interlude into a dramatic section before closing on the lightly bouncing theme. This collection of music is an hour and 12 minutes of excitingly dark composition spread out over 26 tracks. Those who see the film will be looking for this score immediately afterward, and even those who skip the film will find enough impressive music here to stay interested. 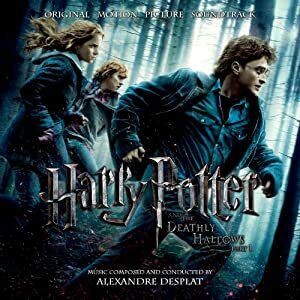 No user commented in " Music Review: Harry Potter and the Deathly Hallows Part One Original Soundtrack, by Alexandre Desplat "